Der 27. Rajab ist ein höchst gesegnete(r) Nacht / Tag und wird Nacht der Berufung (mab’ath) genannt. Am Tag der „Berufung“ wurden die ersten Verse aus dem Herz auf die Zunge des Propheten Muhammad (s.) gebracht. Es ist ebenfalls sehr empfohlen (mustahab) die Ziyara von Prophet Mohammad (sa) und Imam Ali ibn Abi Taleb (a) zu rezitieren. An diesem Tag zu fasten ist sehr empfohlen und es ist eines der vier heiligen Fastenmöglichkeiten bei der man viel Belohnung bekommt. Man wird in Höhe von 70 Jahren Fasten belohnt. 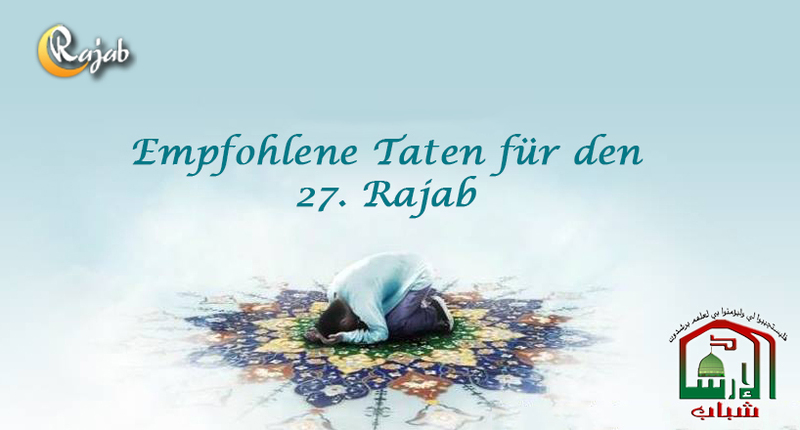 Sehr viele Salawat sind sehr empfohlen am 27. von Rajab. 4-mal Surat al-Hamd (Fatiha), 4-mal Surat al-Naas und Surat al-Falaq, 4-mal Surat al-Ikhlaas. Es gibt keinen Gott außer Allah. Allahu akbar. Gepriesen sei Allah. Alles Lob gebührt Allah. Es gibt keine Macht und keine Kraft außer Allah, dem Höchsten, al akbar.Allah! Allah! Mein Herrscher ich verbinde nichts mit ihm was ihm gleicht. Ich verbinde nichts mit ihm was ihm gleicht. and has taken upon Himself to forgive and overlook! اعْفُ عَنِّي وَتَجَاوَزْ يَا كَرِيمُ. (please do) forgive me and overlook (my evildoings) O the All-generous. alone, there is no partner with You. and Your aid available for those who seek it. and suffice from that which is grasped by the mean ones. but it is their evildoings that prevent them from journeying toward You. I have also known for sure that the best provisions of his who intends to travel to You is a true willpower by which He chooses You among others. and to settle all my needs for this world and the Next World. and You have selected us for this honor among the other nations. O the Lord of Magnanimity and Generosity. and those who hope for Your admission. and abundant possession. Surely, You are Sufficient for us! Most Excellent are You, and in You do we trust! and His blessings be upon them all. and implanted in the great and highest Dwelling. and whom You accommodated in the Noble Place. and achieve for us all our hopes out of Your mercy. وَصَلَّى اللّهُ عَلَى مُحَمَّدٍ وَآلِهِ وَسَلَّمَ. May Allah bless and exalt Muhammad and his Household.